We are currently having issues with our donation links through pricelessparrot.org. We hope to have this issue resolved soon. In the meantime, if you wish to donate please due so at our weebly.com address using ﻿﻿this link﻿﻿. 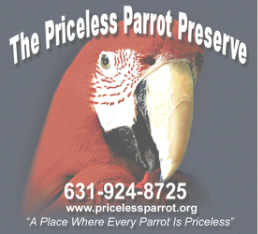 The Priceless Parrot Preserve is a parrot sanctuary located in Ridge, NY that has over 100 permanent flock members. Meet Elmo, the Cherry-headed conure. Elmo lost his first home due to divorce and his second home because he was "too bitey". Now Elmo is a happy member of the Priceless Parrot flock and is one of our friendlier flock members. He even joins us at outreach events! Did you know that there is a large, wild population of Cherry-headed conures in San Francisco? These parrots are native to South America but can survive the relatively mild weather of San Francisco. You can learn more about this wild flock in the film "The Wild Parrots of Telegraph Hill". ﻿We are excited to announce our new partner, the Long Island Game Farm! We will be hosting regular outreach and fundraising events at the Game Farm. See "News and Events" for more details. 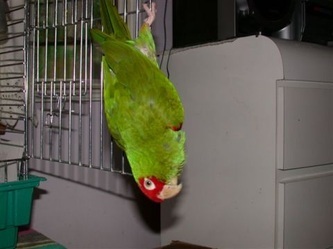 Please consider signing up for welzoo.com and making Priceless Parrot (EIN 11-3624130) your charity of choice. Welzoo-com will donate money each time you sign online! Help to support our flock members by visiting our online fundraiser. A special thank you to the Whole Foods Market of Lake Grove. The marketing and bulk departments at this location have been working together to start donating seeds and nuts to our organization. Anyone who owns parrots knows how thankful our flock members are for this! All photos shown above have been taken by a volunteer of the Priceless Parrot Preserve, Inc. and may not be copied or distributed.